Todd Rundgren’s Something/Anything?, released in February 1972, is exactly a year older than me, and seeing the photograph on the inside of its gatefold for the first time, when I bought the record in the mid-1990s, felt confirming – if not for wholly positive reasons. Rundgren, an American rock musician, is seen from behind in the low-ceilinged living room of his apartment in Nichols Canyon, Los Angeles. Creamy floor-to-ceiling curtains are drawn against strong daylight, creating a hemispherical corner of brightness that illuminates part of what is in the room: music gear, an abundance of it. Caught by recording engineer James Lowe’s wide-angle lens are, among other things, a baby grand piano, a Putney synth, a tangle of floor-bound effects boxes, an expensive Neumann mike (it looks like) taped to a floor mop, and recording equipment on racks glowing in the gloaming. The musician, who at the time was about twenty-four – as, coincidentally, was I when I saw the image – is standing barefoot on a low table covered in all kinds of detritus, including a telephone, paperwork, cans and bottles, and he faces the closed curtains as if they were an audience, arms outstretched and culminating in fingers bent into peace signs. The headstock of his guitar suggests a Gibson, probably an SG. I could identify these specifics without really thinking – though not, at that point, that Rundgren was deliberately, sardonically referencing Richard Nixon’s famous double-handed peace-sign pose in the photograph – because I’d spent years in bands, in messy rehearsal rooms that I mostly wanted to get away from unless I could impose my will onto the musicians (which didn’t often work out), and I am the son of a jazz musician. But this didn’t count for nearly as much as the romance of the image and its wider ramifications, which spoke, still speak – to me, and uneasily so – of self-reliance and private productivity. 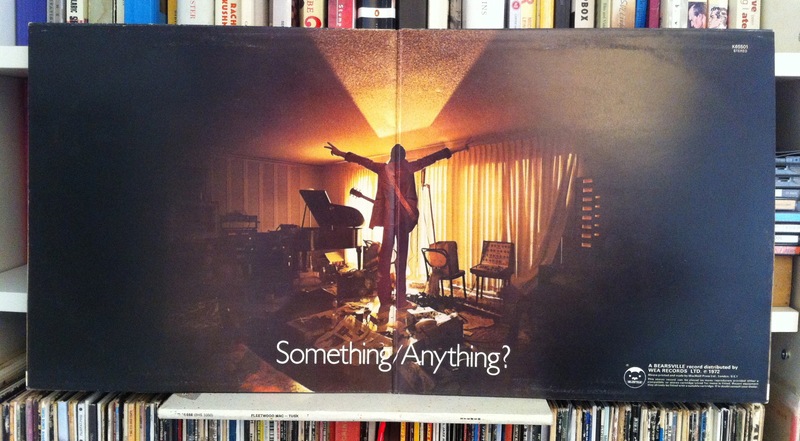 Something/Anything?, the overspilling double album, was three-quarters a one-man-show (its first three sides are wholly Rundgren overdubbing himself with, the critical consensus goes, dazzling results), recorded in proper studios in New York and Los Angeles. So the aloneness that led to the record – the aloneness that the record’s greatness justifies – didn’t happen wholly here; where he is in this photograph doesn’t look remotely like a recording studio but somewhere at home to try out ideas. It was, in fact, where some of the record’s last overdubs were done. But as I read it – and I still read it, somehow, as a time-warped twenty-something – this is physical space as headspace, an external world as allegorical for an internal one. (By the time I saw the image, this could have been the recording studio, such were advances in home-recording technology. And I don’t think I’m alone in projecting such things onto it: in the early 2000s, when people began writing articles about the auteurish experimental musician Ariel Pink, their descriptions of his recording milieu – a guy in a Los Angeles house, blinds down on a sunny day, recording equipment everywhere – sound like descriptions of this photograph.) But to be clear: what I get from this is not an image of a musician per se but a person, any person, in their own bubble of making; and that is what, in ways that have changed over the years, has resonated. When I first started recording music, I had no real desire to be in a band: that was a mistake made later. I multitracked myself, first clumsily bouncing layers between two tape recorders and then using proper gear, usually in a room with the curtains drawn, where it was hard to tell if it was day or night. After a while of that, I got into photography, developing my own photographs in a room with – necessarily! – the curtains closed; curtains like those even, since they were what my mother favoured for our home décor. When I became a writer, the sealed monk cell persisted, was desired: a womb without a view, reconstructed across multiple consecutive homes, via multiple means from curtains to, in one case, cardboard taped over the windows of an outbuilding that used to be a violin-maker’s workshop. The audience is imaginary, gone, not there yet, not yet critical. You stare at the curtains or the cardboard, at a perceived brightness beyond; you don’t deal with human beings and their unpredictability. This kind of lifestyle suits a certain kind of antisocial, or at least anxious and controlling personality only. It allows for a good deal of focus, if you can sit astride the solitude – though privation may not be an issue. One might feel that the life was designed to maximise the work, the work as an alibi for the solitude; and, in turn, what pours out of the solitude, something you hadn’t imagined you were capable of, compensating for it. This photograph, for me more than any other, crystallises that aloneness and, in its questionable air of triumph, how we justify it. (I’m aware that critical writing is a far lesser art than composing or genuinely creative writing; I’m not comparing it; it’s the small thing that’s my own, as has been said.) What I see here, fifteen or so years on, still involuntarily excites me but it deeply worries me too: it represents something that my circuitry at once needs and fights against, which is the urge to keep the door closed, to keep facing something glowing and devoid of people and eminently controllable. The warm light is the next good sentence, article, book; the microphone, the carrier of articulation, waits. Here is what Rundgren did next: he went on alone for a spell while he took a lot of drugs, exploring the stranger corners of his head. Then he left the room – he formed a band and called it, interestingly, Utopia – and then he went back in the room again and recorded a record entitled Hermit of Mink Hollow (1978), and then he left the room again. Etc. We go in, we come out, we go in, we come out and maybe it never settles. The most useful part of this photograph, for me, is that I can’t see the subject’s face. If I spin him around, it might be mine. Martin Herbert is a writer and critic based in Tunbridge Wells, Kent, and Berlin. His most recent book is The Uncertainty Principle (Sternberg Press, 2014). Posted on May 15, 2014 December 8, 2016 by vsmallfires	This entry was tagged gatefold, Martin Herbert. Bookmark the permalink.